Don’t miss this amazing opportunity to learn about and discuss the scientific, religious, political, military and economic aspects of the climate crisis at an event hosted by the Justice, Peace, and the Integrity of Creation Synod of Southern California and Hawaii Presbyterian Church, USA. The conference will feature several respected climate change scientists, activists and other community leaders, including the Most Reverend Robert McElroy, the Sixth Bishop of the Roman Catholic Diocese of San Diego; Dr. Lynne Talley from the Scripps Institution of Oceanography; Rear Admiral Len Hering (U.S. Navy, Ret. ), Executive Director of the Center for Sustainable Energy; and Marshall Saunders, founder of the Citizens’ Climate Lobby. In addition there will be several breakout sessions covering topics such as Community Choice Energy, Climate Justice, Climate Action Plans, Success Stories, and Solutions. The conference is being cosponsored by the North County Climate Change Alliance, Citizens’ Climate Lobby San Diego North, San Diego 350 and Stay Cool 4 Grandkids. 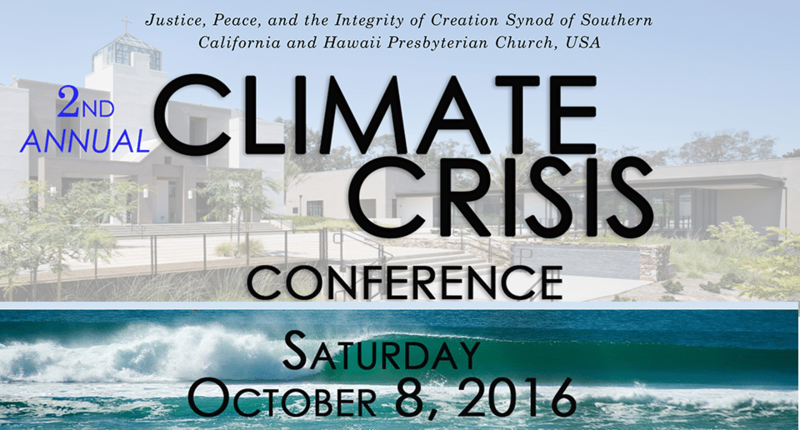 2nd Annual Climate Crisis Conference, by Tom English, Citizens’ Climate Lobby San Diego North, October 4, 2016.